The plainclothes not-so-secret police, or moukhabarat, arrived early, more than 40 minutes before the protest was due to start at 5 p.m. opposite the three-story Libyan Embassy in Damascus last Wednesday. They milled about in clumps of four or five, their black leather jackets and hard stares giving them away as much as the walkie talkies that some barely tried to conceal. They joined the dozens of black-clad policemen, many armed with AK-47s, lined up in front of the high white stone wall of the embassy. The anti-riot police, decked in olive green uniforms, were last on the scene. They assembled at several intersections along the street in upscale Abu Rummane, shields at the ready, the black paint on many of their wooden truncheons worn away. It was a formidable show of force, clearly meant to intimidate. The security personnel easily outnumbered the small crowd of less than 200 that was prevented  by a human barricade of uniformed men  from gathering anywhere near the embassy to denounce violence against anti-government protesters in Libya. Instead, the demonstration moved to a nearby park some 100 meters away. The Syrian government is taking few chances that it will be sucked into the revolutionary vortex in the Middle East. In Syria, the self-declared beating heart of pan-Arab nationalism, public displays of pan-Arab solidarity, even candlelight vigils, are tolerated to a degree but still considered a potential threat to one of the region's most policed states, a country with an almost 50-year-old emergency law prohibiting unofficial gatherings. 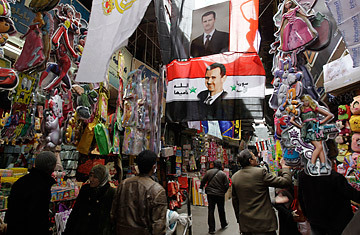 So far, there's been little anger on Damascus's streets. Facebook calls for "days of rage" protests on February 4th and 5th fizzled. There are new rallying cries for March 4th and 5th, as well as the 15th, but few here expect them to fare any better. Several small, peaceful candlelight vigils have been held for protesters in Egypt, although one on Feb. 2 was dispersed violently according to Human Rights Watch, the 15 protesters beaten and accused of working for foreign agents by plainclothes thugs who identified themselves unashamedly to several protesters as "baltagiya," Egyptian slang for paid goons. There was also an uneventful vigil in front of the Libyan embassy on Tuesday. The most successful public outpouring of fury wasn't directly linked to events in Tunisia, Egypt or Libya, although it is unlikely to have happened without them. On Feb. 19, the son of a store owner in Hariqa, near Souq Al-Hamidiyah in Damascus, was insulted and allegedly beaten by a traffic cop. Nothing unusual so far. But then hundreds, and by some accounts more than 1,000 people quickly massed into an angry crowd, chanting "the people will not be humiliated." Within half an hour of the incident, the country's powerful interior minister was on the scene, apologizing and promising that the alleged culprit would be reprimanded. "The Syrian government fears that these demonstrations against Libya and others will plant the idea in people's minds that demonstrations are possible" says Ammar Qurabi, head of the National Organization for Human Rights in Syria. "The regime fears that after a while these demonstrations might transform from supporting the people of other countries to protesting against the Syrian regime." Most of the chants repeated at Wednesday's protest were specific to Libya and its president Muammar Gaddafi, phrases like "Gaddafi, you low-down, Libyan blood is not cheap" (it rhymes in Arabic) and "Green man  leave!" a reference to the president's 1969 coup, or green revolution. Still, several like "You're a traitor if you beat your people" could have just as easily applied to Syria. "Okay you've made your point," a mustachioed officer with a chestful of colorful honorary decorations told protesters who approached the cordon to request permission to get closer to the embassy. "If you don't mind, retreat and go back to where you were." "If you don't mind we want to walk," replied a young woman in the front line. The crowd sensed an opportunity, and picked up a new chant as it inched forward. "Peacefully" somebody shouted. "To the embassy" came the reply. The standoff continued for a few minutes, and then it got ugly.